We all use dystopian movies and books to make sense of our world. Whether it’s Brave New World, 1984, or The Hunger Games, dystopian fiction serves as a common touchpoint to talk about our fears. But what happens when companies knowingly embrace the dark side of futurism and start naming products after the things we were supposed to find scary? Below I’ve compiled a list of just a few products and companies that first captured the public imagination through books, movies, songs, and TV shows. They were products originally created to instill fear in the reader or viewer. But they’re no longer fiction. And I guess they’re no longer meant to be scary. But have you checked the ingredients list for your latest batch of Soylent? Judging by the photo I took below of a Soylent billboard in LA, I’m not sure if that astronaut is holding the product or if she is the product. The 1973 dystopian movie Soylent Green follows a detective of the future who stumbles upon the secret to how the government is solving the world’s food crisis. 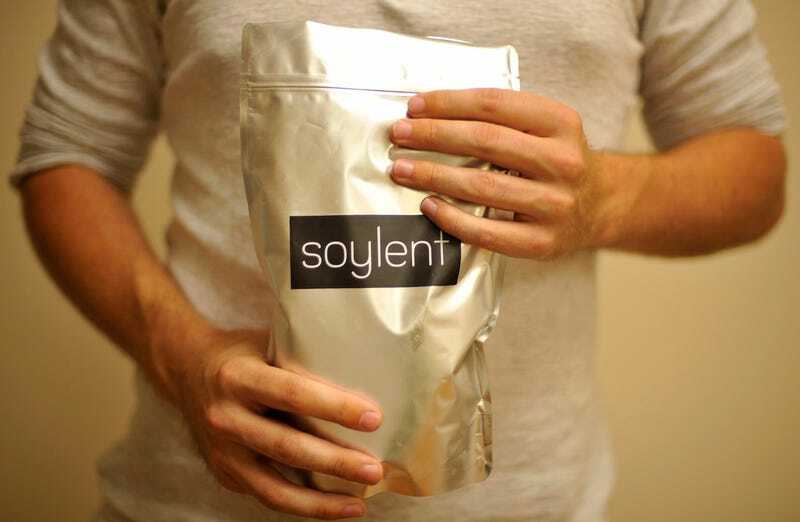 Oddly enough, there’s now a food substitute product named Soylent that’s become a cult hit in the brogrammer crowd. If I need to tell you what Soylent Green is made of in the film (and why it’s so odd to name a food product after it), maybe consider renting the movie tonight. I wouldn’t want to spoil a 40-year old movie for you. Aldous Huxley’s 1931 dystopian novel Brave New World described a bleak future where everyone was doped up on a fictional drug called Soma. In 1959 Americans helped blur the line between fantasy and reality when the FDA approved a muscle relaxant called carisoprodol. The brand name? Soma. Remember the company in the Terminator franchise named Cyberdyne? The one that builds Skynet, a computer network that tries to wipe out the human race? Well, a robotics company in Japan decided it might be a good idea to name their company after the fictional company. Yes, there’s a real robotics company called Cyberdyne. And do you want to hear the real kicker? Their most popular product is an exoskeleton suit called the Hybrid Assistive Limb, or HAL. Remember HAL from Stanley Kubrick’s classic 1968 film 2001: A Space Odyssey? This Cyberdyne company really seems to be tempting fate. Speaking of the Terminator movies, the NSA actually has/had a program called SKYNET. In the films, Skynet is the computer network that becomes self-aware and tries to destroy humanity by setting off nuclear weapons and coordinating an army of robots. The NSA’s version is a bit more humble in that it uses metadata to make connections between people that it deems suspicious. It’s not quite ready to take over the world, but let’s knock on wood. Sure, The Simpsons isn’t quite dystopian fiction. But the fictional beer in the series, Duff, serves as a kind of hyper-consumerist parody of alcohol companies that will do anything to make their products look cool. In the 1990s the Simpsons’ Duff beer and the Duffman were intended to mock the 80s and 90s beer commercials featuring women in bikinis and shlubby guys on the beach who can “get the girl” with the right beer. But now, Duff beer is real. At least in some South American countries and Universal Studios Florida. There’s no word yet if this parody-turned-reality is making its way to mainstream American liquor stores anytime soon. But the fact that it exists at all is a wonderful comment on 21st century consumerism. The word robot may seem like it’s been around forever, but it was actually coined in 1921. The word comes from a sci-fi play titled R.U.R. by Czech playwright Karel Capek. The play tells the story of humanoid machines that eventually stage an uprising against their human masters. Automatons certainly predate 1921, but when Capek coined the term robot in the early 1920s, they were definitely a work of dystopian fiction. Love them or fear them, the word robot has definitely been embraced over the past century. Back in 1977 it was just an innocent Jimmy Buffet song. No one imagined that Margaritaville was a dark work of dystopian fiction that warned of the horrifying days ahead. Days of lost possessions, bloody feet, and a mystery about who’s to blame. Today, those haunting lyrics have been turned into a chain of over 30 Jimmy Buffett’s Margaritaville restaurants spanning the globe. Smell those shrimp; They’re beginnin’ to boil. Sure, seems innocent enough. Until you get to the chorus. But I know it’s nobody’s fault. He lost his salt shaker? This is starting to turn bad. But it’s a real beauty, A Mexican cutie, how it got here I haven’t a clue. He doesn’t have a clue? This is really beginning to sound dangerous. Now I think, - hell it could be my fault. Uh oh. Whose fault is it, Jimmy? WHOSE FAULT IS IT? But I know, it’s my own damn fault. And I know it’s my own damn fault. The horror. What a wretched god-forsaken world Mr. Buffett describes in his 1977 classic. And don’t even get me started on Cheeseburger in Paradise. Man, you wanna talk about dark, plug “Cheeseburger in Paradise” into the old 8-track for a night of introspection. And now, just like Margaritaville, it’s a chain of family-friendly restaurants. What a time to be alive.